What does it look like to be a woman of grace? If we're walking closely with Jesus and living freely in His grace, that grace will spill out of our lives. We will be able to offer this gift to others. And one of the most prominent ways we can do so is with our words. 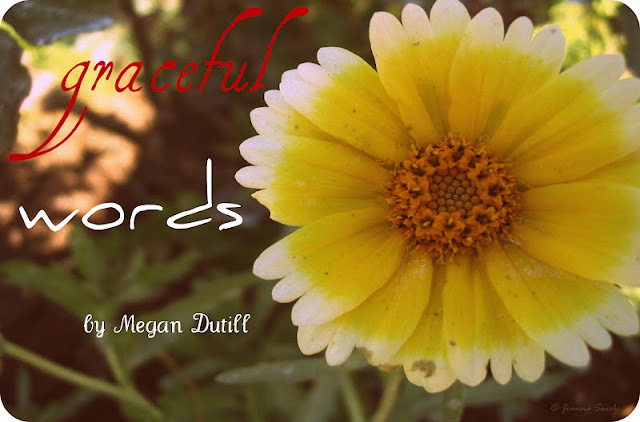 Matthew 12 says that "Out of the heart the mouth speaks" - do your words reflect a graceful and loving heart? I'm sad to admit that mine don't, not nearly as often as I wish they would. But words are important, and have far more power than we usually give them credit for. God created the world by speaking. And in Deuteronomy 32, he says that his commandments are "not just idle words for you - they are your life." Words of grace are words of life and creation. We can speak life, hope, and healing into another's life. Our words can be water to parched souls - or they can be cutting and deadly. "If anyone speaks," Peter writes, "he should do it as one speaking the very words of God." (1 Peter 4:11). The very words of God. Talk about pressure! But what does this look like practically? How can we speak words of life and grace into another's life? It means listening, really listening, and being sensitive and gentle no matter what the situation is. But one good indicator is how we respond when a friend falls, as they will over and over. We're human. They will fall and fail, and we will fall and fail. Grace is forgiving. Grace offers mercy. They don't deserve it (neither do we!) and that is the point. Love never gives up on a person: and grace doesn't, either. Offer a second chance when they don't deserve it. Offer healing, not condemnation. They've already gotten plenty of that. And in our everyday interactions? I believe it was CJ Mahaney who first introduced me to the idea of looking for "evidences of grace" in each other's lives. It's often so hard for me to see where I'm growing, what God is doing in my life - if anything. It's like a child measuring his physical growth - yes, he's growing every day, but can he tell the difference, day by day? No. But someone else - who doesn't see him every day, perhaps - will be able to clearly see that he's grown taller. It's the same spiritually. We may grow in tiny increments, and may even get discouraged that the growth is so slow. Intentionally noticing growth and grace in another's life - and telling them - is incredibly encouraging and life-producing. All encouragement, as a matter of fact, is full of grace, love, and life. What do you think? Do you have more ideas for growing in graceful speech? it was a nice post. thanks for this, it serves as a reminder to me.. keep inspiring. Be bless and God bless! Thank you, Lhen! And Aubry - it's a struggle for me too. But it's so important to show others we love them by listening :-) Reminders are always good!